This stunning space wallpaper shows a patch of sky from the COSMOS survey, as viewed by XMM-Newton. COSMOS is a project studying how galaxies form and evolve, gathering observations using a variety of ground- and space-based telescopes. This stunning space wallpaper shows a patch of sky from the COSMOS survey, as viewed by XMM-Newton. COSMOS is a project studying how galaxies form and evolve, gathering observations using a variety of ground- and space-based telescopes. This image alone features about two thousand supermassive black holes, and over a hundred clusters of galaxies. Small point sources dotted across the frame show supermassive black holes that are hungrily devouring matter from their surroundings. 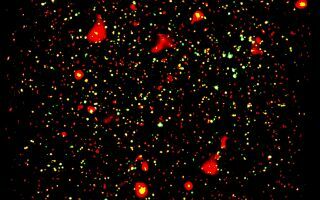 The larger blobs in this image, mainly red and yellow, reveal another class of cosmic behemoths: galaxy clusters. This image was released April 22, 2014.